Show and tell the world about your latest obsession with comfort as you adorn this shirt, in navy blue coloured, from the house of Mufti. Let your skin feel the cool breeze as you adorn this shirt fashioned using 100% cotton. 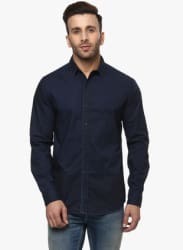 For the urban man of a metropolitan, this slim-fit shirt is something that will highlight your sculptured torso when paired with chinos and loafers.